The consistency of Maybelline BB cream is just like a foundation, not too thick nor too thin - just perfect. When I first swatched it at the store, on the back of my hand, I fell in love with the dewy finish. Without thinking more, I picked it up. The moment I tried it on my face, it was a BIG disappointment. I used a little more to build it up, tried in many ways but just couldn't like it. The main reason to buy a BB cream was to even out the skin tone and for slight coverage for summers, without it feeling heavy on the skin. The finish of Maybelline BB cream is more like a moisturizer. If I had amazingly clear skin, I would've loved it - MAYBE! I picked the shade 'Medium'. It has 5 shades. 'Medium' is a shade for fair to medium skin tone. The conclusion is, it is sheer and doesn't cover up. It's better to use nothing, than to use Maybelline's BB cream. It might be good for young skin, with no imperfections and for starters. 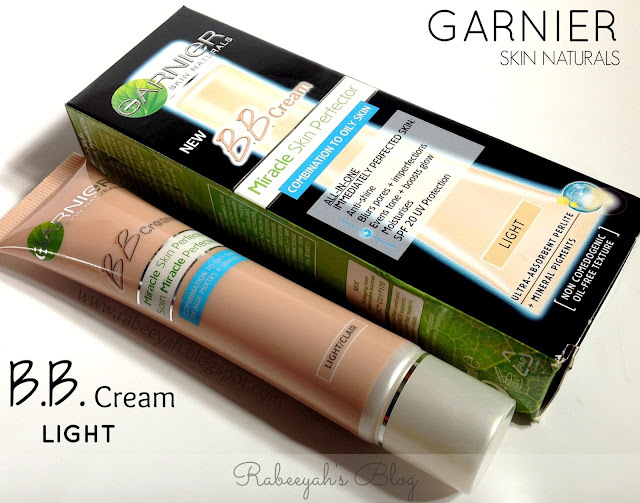 The consistency of the Garnier BB cream is thin and runny, which can be a pro and a con. Pro, because it makes blending easier and feels light on the skin, a con, because it can get messy while applying and if you leave it open. Make sure to shake it well prior to using it. Keep it upright, and pour a little on your fingers and work in portions. Blend it downwards using your fingers. 'Light' is the shade for medium to fair skin tones. However, it doesn't look white or too light, instead it blends into your skin tone and brightens up the skin. It blends in effortlessly and camouflages the discoloration. It doesn't tighten the pores or make you sweaty. It minimizes the pores and control shines for a good 6 hours and more. It claims that the light formula does it all; mattifies, reduces the appearance of imperfections, hydrates, evens skin tone, gives healthy glow and protects with SPF 20. I would agree with what they claim. I have been using it for more than a month now, and I saw the difference. Dermatologically Tested. Oil-free texture. Non comedogenic. The texture of the this BB cream is thick, almost like a cream foundation. As it is thick and creamy, I had an idea that it will be heavy for summers and I was right about it. The moment I applied it on my face I felt had something very oily and heavy on my face. Within 2 minutes I had to remove it, because my face started to sweat and I could feel something warm on my face. When it started to sweat, I wiped my face with the finger, and it was coming off. My cousin who lives in the UK, loves it because of the dry weather and her dry skin. I think I will try it once more in winter. For summers, it's a total NAY! It comes in 2 shades. The one I have is 'Light'. Light is a shade for fair to medium skin tones. According to the swatch, you may notice it doesn't look that light. It blended into my skin, and mixed in with my skin color. Rimmel claims it to have 9 in 1 results: Primes, Moisturises, Minimizes Pores, Conceals, Covers, Smoothes, Mattifies, Brightens and helps protect. Has SPF 25. To be honest, I can't comment much about it, but I think it definitely covers. For a detailed review, I have to wait few more months. It is good for dry skin, and for dry weather. As you can see, the consistency of all the 3 are different. Rimmel BB Cream is the thickest, covers up a little, whereas Garnier BB Cream is the thinnest, is light weight and evens out the skin tone and makes your skin matte. Compared to the picture above, in which I used it on my face, the Maybelline BB cream gives no coverage. To reach to a conclusion, Garnier BB cream for combination to oily skin worked the best for my combination skin and in the hot and humid weather in Karachi. The others might work on different skin types and according to weather on some people. Do I need a concealer? Yes, you need a concealer if you have dark circles and if you want to hide your spots. Do I need a moisturizer or sunscreen before using it? Yes, you need a moisturizer before using anything on your skin. You don't need a sunscreen as it already has SPF 20. Do I need to dust powder on top of it? If you want to. I like to use MAC studio fix powder to slightly dust over it for a more matte look and to prevent from oils. 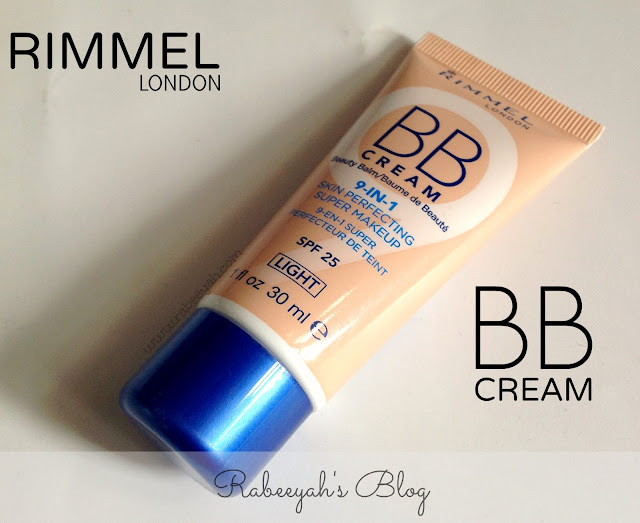 I hope this post helps you in selecting the RIGHT BB cream for yourself. All the three BB creams are available on Just4girls and all the leading Supermarkets. I got mine from Naheed Supermarket. Did you buy a BB cream? Which brand? Did you like it? Fantastic comparison Rabeeyah. I personally am in LOVE with the Garnier one for normal skin. Man, I did not expect to like it as much as I did. And with the Rimmel Stay Matte powder,the face routine for summer is pretty much done! I have oily skin and a medium/light complexion but Garnier one doesnt do the trick. Maybelline gives me an incredibly dewy soft look which I can just touch up with a compact. I wish i could get such a good comparison of asian bb creams!! my favourite post by far! loved the idea! great review and a much needed one i must say.I am so glad i bought garnier bb cream.I hope it works for me the way it did for you.I just love the texture and the natural fifinsh.Maybellin bb cream gave ashy finish dont u think? i was thinking to go for rimmel but now might go for maybelline or Garnier. I love the Garnier one!! Its super light and feels amazing on the skin. Will def repurchase it when I run out.